I thought it was bad enough when NAR launched their print ad telling people to “Buy or Sell”. 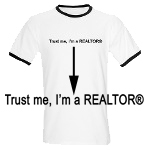 Talk about it here: Can you trust your Realtor? New NAR ad reviewed. Now they just launch a TV campaign to “Buy Now/Sell Now”. Dear Ms. Combs (NAR Pres), can I suggest a new focus for NAR? It will help everyone in the long run and help the deteriorating Realtor image. I am pleased to announce the launch of the 2007 Public Awareness Campaign. This will be an exciting year, highlighted by the integration of the “Buy Now/Sell Now” messaging into the already successful Public Awareness Campaign, and an expansion of the campaign, keeping REALTORS® top-of-mind with consumers through radio and television placements from January through November. I hope you’ll be pleased with the results. I wanted to give all of our members a special preview of the 2007 campaign materials. This e-mail includes links to the recently redesigned Public Awareness Campaign Web site, where you can view and download the new campaign materials, see the 2007 media buy schedule, and learn about the 2006 research results. This year the campaign aims to drive business directly to REALTORS® with a new call-to-action, “Every market’s different, call a REALTOR® today.” The campaign speaks directly to today’s home buyers and sellers to convince them that REALTORS®‘ expertise and experience are invaluable in the current real estate environment of increased inventories, stabilizing prices, and historically low interest rates. The campaign will begin airing nationally January 15 on network television. Radio will follow three weeks later. To view this year’s new materials click here. To view the 2007 media schedule click here. To view the 2006 research results click here. The campaign includes Web banners, presentation materials, and other resources that you can use to enhance your business activities, so please visit the Web site, and share the campaign with your clients and colleagues. The link goes to a page showing a family and reasons for it being a “Good Time to Buy” and another ad saying “Know How to Sell”. First note that the email says “Buy Now, Sell Now” but the ad does not say it is a good time to sell. Instead they focus on what you need to know to sell. It would have been just absolutely nuts if they really had a TV spot on why you should buy, while another spot says you should sell now. And continue to go over the PROS and CONS of buying. Not just perpetuating the PROS and ignoring the risks, or mumbling them under your breathe. I take a different approach with my clients. I play devil’s advocate. I try and talk/scare them OUT of buying or at least fully digest the risks. If they survive that and still want to buy, great, I’ll help them.